In today’s progressive technology era, Mobile Solutions are a de facto need for any Enterprise Business to be successful. We help organisations make maximum benefits from Mobile Solutions. We develop mobile device-friendly mobile websites, mobile apps that are very user-friendly, attractive, fast, safe and secure. 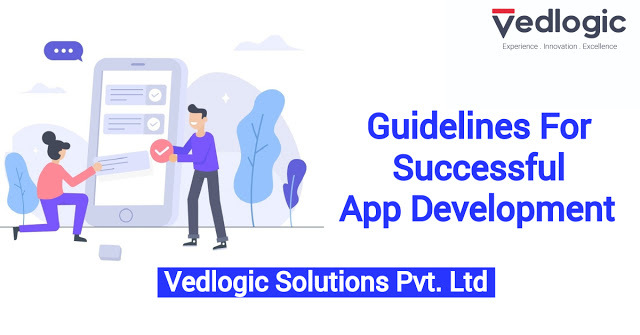 Vedlogic Solutions, as a #1 outstanding App development company issues such applications every now and then from clients and hence, for freelancers and dedicated app developers, we are Performing accessible, simple, easiest guidelines to increase your chances of success app development process. Following are the fruitful tips to your next development process to painless develop mobile apps. Never let our app experience from the lack of any new features and functionalities by selecting an old version of the development platform. With the recent trends of development, always upgrade for the recent version to make sure that your app consists of all the new trends. Just focus on your business needs and simply associate up with customers’ need won’t do the job. You’ll need to make it engage with the advanced features and functionalities available so that your clients feel connected and use your app regularly. Keeping end-user’s prediction in your mind, you’ll have to bring out all the latest trends for app to be visually engaging as well as user-friendly at the same time. The development of an app requires extensive preparation and planning. There are many important steps needs to consider such as your app’s goal, scalability, secure, theme, interface, bandwidth, API, Skinning etc. App to be successful, you’ll need to list the accurate details working of your app. You’ll need work on all the aspect of important planning of your app to screening all the designing component and developing process. These may include specifying the goal of your app, the scope for features & functionalities to include appealing theme, icons, buttons, graphics, User interface, bandwidth, language etc. App should be uniform across every version of app which will give your users an approach of knowing the app. This is of ultimate influence as the limited interface of your app could take away customers interest in using your app. Thus, the compatibility of your app with respect to different devices and versions are important and crucial in making your app successful. Developing secure Mobile Apps is our key expertise. We follow various standards like OWASP, SANS Top 25 and other regulatory compliance to take care of security at every stage of Mobile App Development. The engagement of your customers on your app is a very necessary step as it defines the achievement of your app in many ways. You’ll need to apply digital marketing and optimization strategies to reach your target audience as there are many other apps also available in the same category on the app store. You’ll also need to constantly keep on running promotion and marketing of your app to capture the powerful market of the industry.